You might not see these people around town. They stick together and avoid attracting attention. But in your local mushroom patch you're sure to find them. Eastern Europeans, that is. Poles and Czechs, Russians and Ukrainians, many of them recent immigrants in the years following the dissolution of the Soviet bloc. They have a long tradition of scouring the woods of their homelands for edible fungi. Mushrooms are often thought of as basically nutrient-free. This is not the case. Fungi can boast a number of important nutrients, including protein, and while a meal of mushrooms isn't equivalent to a steak dinner, to an Old World peasant not that long ago it might have been the difference between making it through the winter and starvation. No wonder Eastern European fungal folkways have been handed down over the centuries—and they're alive and well in North America. There's a mushroom patch that I frequent in the mountains east of Seattle. Actually, it's more of a huckleberry patch, but sometimes I'll pick mushrooms when I'm there. Every October I see the Eastern Europeans parked in the many turnouts along the forest road that leads to it. 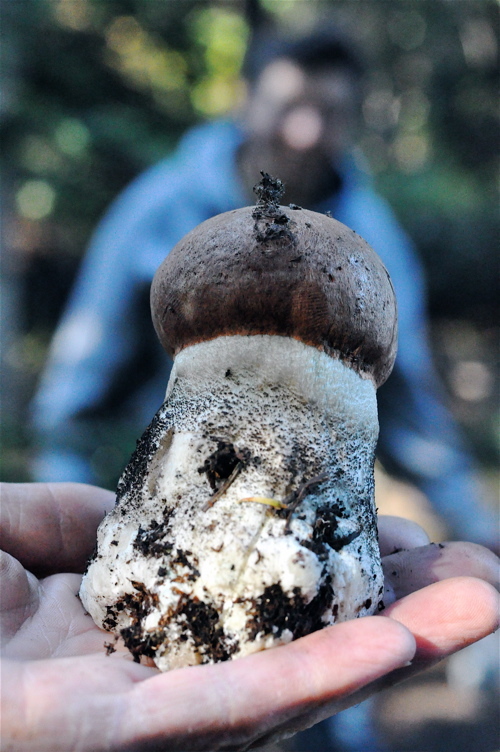 They're in search of boletes, especially Boletus edulis, which they call the "white mushroom" as well as a number of other species in that family that most recreational mushroom hunters rarely consider for the table. They vacuum up the many slippery jacks and scaber stalks of the forest. Last year I happened on a troop of them in the bush and I wish I had been able to get some clandestine photos. They looked as though they'd just stepped off the set of a Hollywood movie about gypsies, wearing handmade clothes—the women in ankle-length skirts and babushkas in the middle of the wilderness—and calling to each other through the woods in an indecipherable tongue. As soon as they saw me they turned tail, as if engaged in some sort of furtive, illegal activity. Many of the Eastern Europeans, for reasons that are obvious to even the most casual student of history, are reluctant to talk to strangers and view anyone outside their cohort as a potential authority figure best to be avoided. Just the other day I was more lucky. I found a group of Ukrainians working a patch who were willing to talk. Already they had a couple five-gallon buckets filled with slippery jacks, red caps, and the odd king bolete. One of the two women spoke decent English and explained that they were from a village outside Kiev. She wouldn't submit to a photo but her picking partner agreed to hold up what they called a "brown cap." 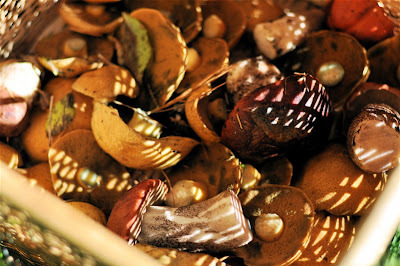 They differentiated between three different types of Leccinum: red caps, brown caps, and black caps. This is a notoriously difficult genus to key out at the species level, and there is some debate even about the edibility of these mushrooms in general since they are known to cause illness on occasion, with one poisoning case in particular that has made the rounds recently. The other prevalent genus, Suillus, which includes slippery jacks and jills, is ubiquitous on the forest floor but as the common name suggests, often slimy. The Ukrainians said they peeled the cap and then boiled the mushrooms in salted water before pickling or canning. A dash of lemon juice, they said, made all the difference. These are seriously labor-intensive mushrooms and I've never done much with them. Some people will dry and powder various kinds of Suillus for use in soups and stews. Also that day I met a man from Moscow named Eugene. 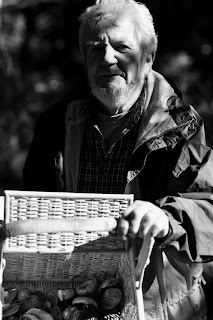 He was picking with his wife and had a basket filled with similar species (shown at the top of this post). Eugene said he sliced and salted the mushrooms before preserving them. We exchanged email addresses, a level of communication that initially surprised me, but when I tried to send photos to Eugene the next day my message bounced. I don't mean to sound like a cultural tourist, but I think it's cool that an activity like mushroom hunting can introduce you to a diverse group of people from around the world. I'm hoping that I can get to know a few of these folks and learn their methods of mushroom preparation. But asking questions in the bush doesn't always get you far. You can understand why people hailing from the former Soviet bloc might be suspicious. The Ukrainians were surprised that I was alone. "Not good to be alone in woods," one of them said to me. As if putting an exclamation point on the statement, a quick volley of gunfire echoed through the hills. Just target practice, I said. They looked at me with raised eyebrows. "Yes, maybe." lucky you! What a great adventure. Thanks for sharing! I met some "Russian" peasants foraging for nuts in a state park several years ago. Most were elusive, but one woman who didn't speak English showed me how she cracks walnuts with her bare hand. I would remind you that many immigrants are in this country illegally and have good reason to be elusive. Le Loup - Thank you. Kirsten - I enjoy talking to people in the woods. I also like to remind them that it's not okay to dump their trash. It would seem some of the mushroom hunters need to hear this. Bikejuju - Thanks for the link. I've read it but have yet to try eating A. muscaria myself. Amanitas are dangerous and even potentially edible species require excellent identification skills and careful preparation for the table. Anonymous - My guess is that most Eastern Europeans are here legally, though I haven't bothered to research this assumption. Here's a blog post by @FreshPickedSEA about commercially pickled slippery jacks brought back from Russia. I'd heard the Soviets (Russian, Moldovans, whatever they're calling themselves now) ate them, so I dried and powdered the shrooms. Great aroma. Dust it on venison loin! I very much enjoyed reading this post...thank you. We have a large Russian population here in PDX and they are a tight group, but that's what makes it so interesting if they are willing to talk to an outsider. There's a Polish deli ("George's") on First Hill across the street from the Sorrento Hotel on Madison Street that has a variety of bottled mushrooms. I remember seeing slippery jack on one of the labels. They also have great home smoked deli meats and fantastic sandwiches. Nanny is keeping a very close eye on you. Brings back great memories. When I was in grade school in the late 40's early 50's just North of Boston we had many immigrant families. The children would come to school speaking no English and by mid-term they spoke good English but with an accent of course. They bacame friends and I would visit the homes. Rarely did you get invited inside but their children were always interrogated about who this blond headed boy was waiting outside. They used to pick dandelion leaves and roots as well as mushrooms and other things I couldn't identify and many of them favored grape leaves to wrap golumpkies. I live on the West coast now and you take your life in your hands encountering a mushroom picker in the woods. They are territorial and have been known to shoot someone they think is competing for the mushrooms. I found a 50+lb patch of scaber stalks in mid-September near my home in Ithaca, NY. There were some truly gargantuan specimens - these things are heavy and satisfying to pick. Unfortunately, we made the mistake of ripping off the spores to let them spread in the wild as we do for most of our bigger porcinis. By the time we got home, the mushrooms looked like they had taken a bath in a coal bin. They have a dramatic black staining reaction which is quite unappetizing looking. As you say, even perfect, in tact specimens still turn black upon cooking, so it seems drying and powdering truly is the best option for this species. I am shocked they are considered such a delicacy in Eastern Europe, but I am glad they get so much enjoyment out of them. Perhaps I should try pickling them? I enjoyed reading this post and comments. Picking mushrooms is great fun in our part of the world. We collect much in autumn and put them into jars and freezers for winter. Delitious! I have few recipes with wild mushrooms in my cooking blog, but it is in Lithuanian. If you are interested I could translate. maybe this one http://www.7ravioli.com/pyrageliai-su-grybais-2/ ?